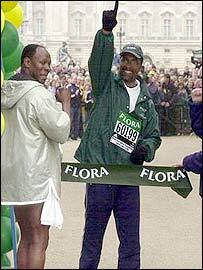 Brain damaged ex-boxer Michael Watson has completed the London Marathon, six days after he set out. 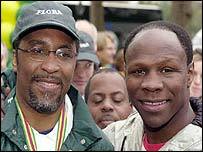 Watson, who has been raising money for the Brain and Spine Foundation, was accompanied on the final leg by Chris Eubank - the fighter who left him with the injuries that almost cost his life. "I feel super," Watson said after completing the marathon. "I feel extremely overwhelmed. Look at the support - how could I go wrong? There are a few blisters on my feet, that's about it. I've loved all of it. "Each mile, every step of the way, I got stronger. Each and every day the crowd got larger and larger. It's been fantastic - I've enjoyed myself from day one." Asked what had carried him through the journey, Watson told reporters: "My faith in Jesus Christ. "My people have done a lot for me in my life I want to pay my respect to them." During the marathon Watson, who is partially paralysed, covered two miles every morning and afternoon. Each mile took him an hour to walk with Watson resting and sleeping in a support bus following him along the route. Before setting out with 33,000 other competitors last Sunday, Watson received messages of support from Muhammad Ali and current WBC champion Lennox Lewis. Along the way he was met by the likes of Audley Harrison and Frank Warren from the world of boxing and comedian Ricky Gervais as well as hundreds of other well-wishers. Former boxer Spencer Oliver, who also suffered brain damage, also joined Watson and Eubank for the final mile. After collapsing in the 12th round of his 1991 title fight against Eubank, Watson spent 40 days in a coma and had six brain operations. Doctors predicted Watson would never walk again. He spent years in a wheelchair and does not have full use of the left side of his body. "I'll do it again next year"